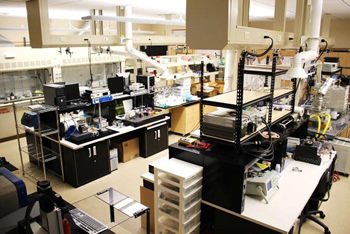 The Active Materials and Smart Living (AMSL) Laboratory at the University of Nevada, Las Vegas (UNLV), has the capability of fabricating the proposed materials and test their performance. In particular, the Kim’s condensation testing facility is very unique and well versed in the research community (www.youtube.com/user/kwangkimlab). The AMSL is located in the Science Engineering Building (SEB) on the 2nd floor, Room #2112) at UNLV with allocated space of about 1,300SF plus additional common space. 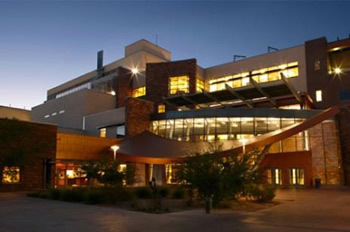 SEB Building at UNLV where Kwang Kim’s Lab is located. The mechanoelectrical testing setup includes two electrodynamic shaker assemblies with amplifiers and vibration controllers (by TIRA and Vibration Research Corp.). The mechanoelectrical output is amplified through custom-designed signal amplifier and recorded with National Instruments/LabView DAQ system. The setup is capable of measuring the material’s sensory properties in a broad frequency range at constant or variable (sweeping) frequency settings. 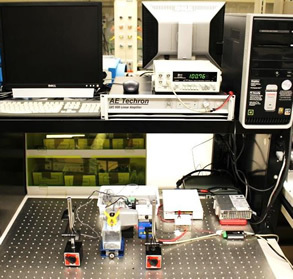 The electromechanical testing setup includes laser displacement sensor (Micro-Epsilon) and load cell (Transducer Techniques) for measuring the displacement and force output of the active material. The data acquisition is provided through National Instruments DAQ boards and LabView system. 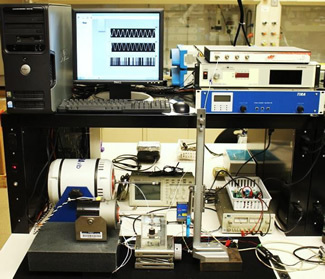 This equipment enables characterizing material’s electromechanical performance under DC or AC driving inputs at various frequencies and waveforms. Machine Shop/Technian Support: Full-service machine and welding shop staffed by a full-time machinist, used for fabrication of research equipment and student projects. Also, a laboratory technian is available for electronic instrumentation.